OUR CHALLENGE THIS WEEK AT COME AND GET IT IS- WINGED THINGS. I LOVE THESE BUTTERFLY BEARS. I HAVE SEVERAL OF THEM FROM BUGABOO STAMPS. THIS ONE LOOKS REALLY RELAXED. I STAYED AWAY FROM THE PINK COLORS TO MAKE THIS ONE LOOK A LITTLE MORE MASCULINE BUT IT COULD BE GIVEN TO A MALE OR FEMALE. 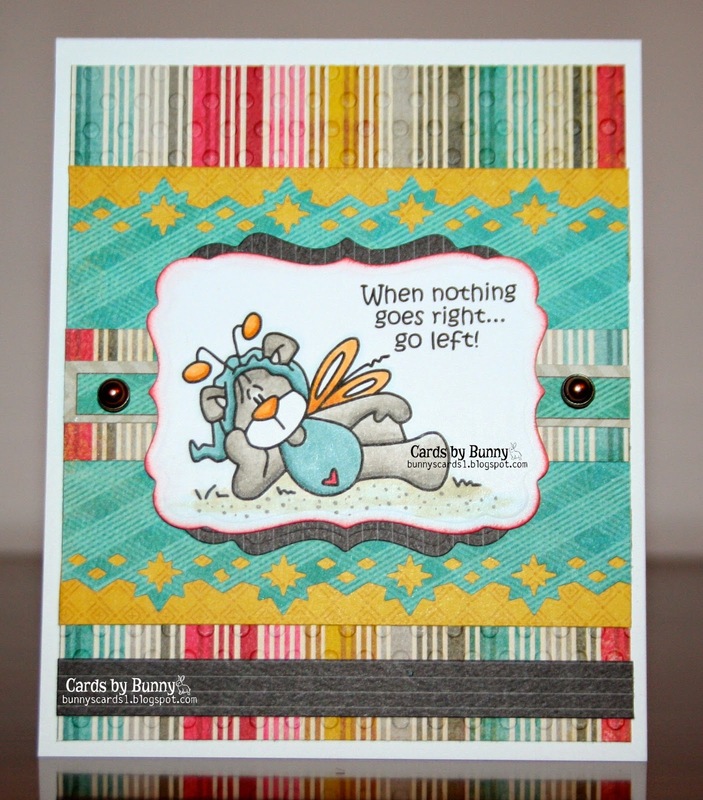 What an adorable Bugaboo image, and a darling card. You do such nice work, Bunny. Thanks so much for sharing with us. This card totally makes me happy - I need to see this sentiment as it seemed like nothing has been going right lately! Love your use of all the pattern paper layers, too! Thanks for joining us in our Anything Goes Challenge at MarkerPop! I just love this image! So pretty! Great pattern on the background! Thank you for joining us at Sister Act card challenge! This is too cute...You colored the cute image beautifully and love your choices of DP's. I am grateful that you joined us in our Challenge and we have a new one starting today. Please link with us again at Word Art Wednesday. Leaving you an inspirational verse as spoken by Jesus to them that believe from John 14:21 and it says, "Whoever has my commands and keeps them is the one who loves me. The one who loves me will be loved by my Father, and I too will love them and show myself to them." A blessed week to you always.